This review first appeared in the February 24, 1995 issue of the North County Blade-Citizen (now North County Times). Harmonica player Big Bill Hickey may be an unfamiliar name to most blues fans, but the two guitarists on his new release are certainly not. 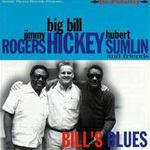 Legends Jimmy Rogers and Hubert Sumlin, veterans of the Muddy Waters and Howlin' Wolf bands, respectively, sit in on "Bill's Blues" and lend the proceedings an immediate credibility. But listen to Hickey's own playing and you'll need no convincing of his bona fides. The one-time Walter Horton protégé is a fine harpist and a strong singer to boot. There's nothing ground-breaking about the music here  it's standard Chicago shuffle/boogie blues, with a couple of covers and a bunch of solid originals that could easily find a comfortable niche in the blues canon. The album's peak comes on a strong cover of Horton's classic "Easy." Hickey's tremolo-filled harp lead plays well against Sumlin's sparse guitar, capturing the feeling of the original without sounding like a tribute.